Fred She Said Designs offers a wide variety of digital products with a floral flair and cute characters too - Digi's, Pre-coloured images, Papers, Sets, and Fred's Flower Kits. Have some fun with Fred! 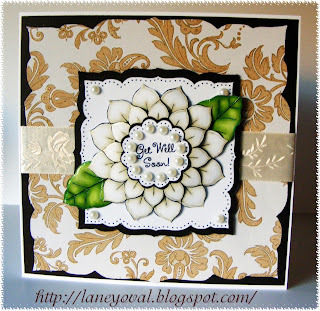 Cant wait to see what you create,dont forget to pop over to http://onestopcraftchallenge.blogspot.com/ to see what the rest of the team has made!! Fabulous Laney, great die and gorgeous card for the occasion. Absolutely stunning...Love the layers and how you placed the sentiment in the middle, circles with pearls. Love "Fred She Said" images!! Thank you for joining us at Sentimental Sundays. What a gorgeous card! Thank you so much for joining us this week at Make it Monday! Don't forget to leave a comment for another entry and mention you saw them on MIM; the more comments left, the greater your chance of winning our second prize! Beautiful neutrals, Laney, and I love the pearls! Thanks for playing in our 'Stuck in Neutral' challenge this week at Tuesday Throwdown. Good luck in the draw and we hope to see your wonderful creations again next week. Thanks for playing along with us at Sentimental Sundays for our ribbon challenge! Lovely card, and the pearls just top it off nicely. Thanks for joining us at the Unstampabelles Challenge.